Fred MacMurray and his shaggy, car-driving co-star. In hindsight, The Shaggy Dog (1959) was a landmark Disney film. After all, this amusing comedy perfected the formula for the contemporary live-action family films produced by the studio for the next twenty years. It was also the first of Fred MacMurray's five Disney films--and, according to some sources, it inspired his long-running TV sitcom My Three Sons. Pretty impressive for a comedy about a teenager that periodically transforms into a sheepdog! Tommy Kirk stars as Wilby Daniels, the kind of teen inventor that accidentally launches a missile interceptor through the roof of his family's house. That doesn't sit well with his grumpy father (MacMurray), a postal carrier who hates dogs--even though his younger son Moochie (Kevin Corcoran) badly wants one. Moochie gets his wish, more or less, when Wilby accidentally comes into possession of a ring owned by Lucrezia Borgia. When he tries on the cursed ring, he transforms into a sheepdog owned by his pretty, new French neighbor (Roberta Shore, whom we interviewed in 2016). 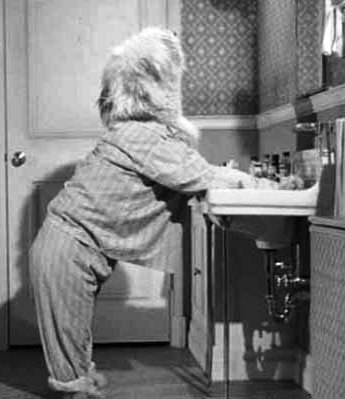 Later, Wilby transforms back into his human self, but continues to turn into into a shaggy sheepdog at the most inopportune moments. He seeks help from Professor Plumcutt (Cecil Kellaway), who informs Wilby that he has invoked a curse that can only be broken by a heroic act. Thank goodness, while in his canine form, he discovers a spy ring in the neighborhood! Kevin Corcoran was a Disney mainstay. Although it was loosely inspired by a 1923 novel called The House Florence, The Shaggy Dog owes much to Old Yeller. That family drama, made two years earlier, teamed Kirk and Corcoran as brothers for the first time. And it was about a dog, too! Of course, Old Yeller is a very different film (Tommy Kirk's big scene near the end always gets to me). 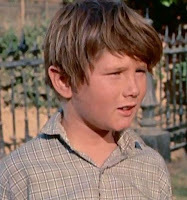 Still, it's apparent that Walt Disney recognized the natural brotherly connection between the teenager Kirk and ten-year-old Corcoran. 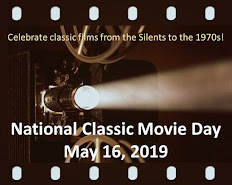 The two got along well and appeared together in a total of five Disney pictures, portraying siblings again in Swiss Family Robinson, Savage Sam (a sequel to Old Yeller), and Bon Voyage!--which also featured Fred MacMurray as their father. 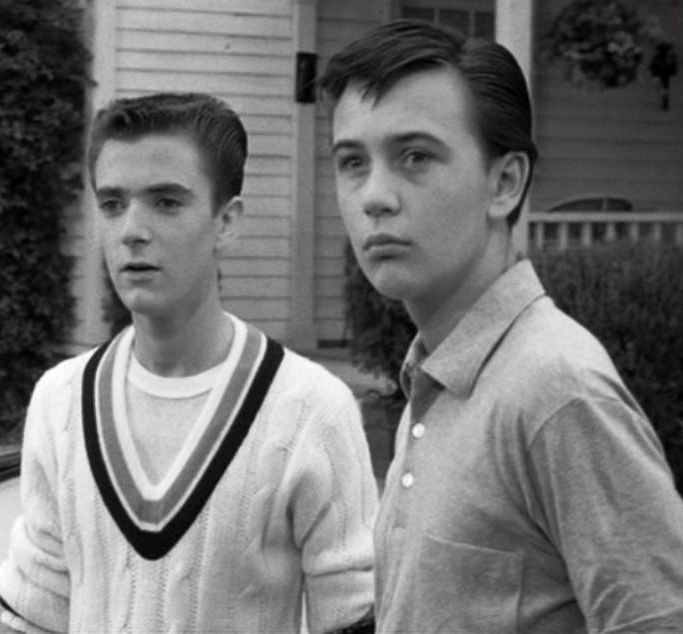 Tim Considine and Tommy Kirk. 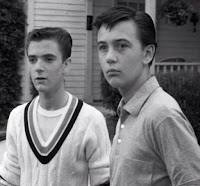 However, it was another Shaggy Dog star, Tim Considine, who would become one of Fred's sons when My Three Sons debuted in 1960. Considine only has a small role in Shaggy Dog, playing Wilby's rival for Annette Funicello and Roberta Shore. Earlier in his career, he played Frank Hardy opposite Tommy Kirk's Joe Hardy in two serials about the sleuthing Hardy Boys. The Shaggy Dog also introduced the "absent-minded inventor" theme that provided the plots of numerous Disney comedies. Kirk played a college student with a passion for a wild experiments in The Misadventures of Merlin Jones (1964) and its sequel, The Monkey's Uncle (1965). His Shaggy Dog co-star Annette Funicello played his college sweetheart. Meanwhile, MacMurray had one of his biggest hits in the title role of The Absent-Minded Professor (1961) and its sequel Son of Flubber (1963). As for the original Shaggy Dog, it was a big hit that resulted in a belated sequel The Shaggy D.A. (1976), with Dean Jones as the adult Wilby. It also spawned several additional sequels and remakes. That's a pretty impressive legacy for a movie about a teen were-dog. I seem to recall reading somewhere that The Shaggy Dog was originally earmarked for the Disney TV series, but ABC rejected it out of hand. 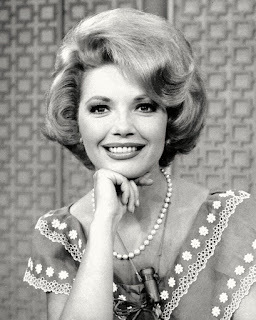 This in its turn was one of the factors that led to Walt Disney's decision to move the TV show to NBC a couple of seasons down the line. I didn't realize Tommy Kirk and Kevin Corcoran did so many films together. Like you said, they do have good brotherly chemistry. 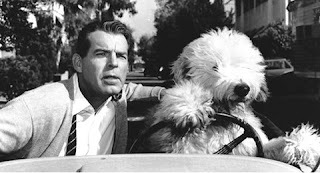 I love the classic photo of the shaggy dog driving the car! In fact I looked up P. D. Eastman’s “Go, Dog. Go!” and found that it was written in 1961, two years after this classic. I wonder if he could have been influenced by it? I love this film! In our family we watch it annually in the summer on a Saturday night and I never tire of it. A little trivia: The Hound of Florence was written by Austrian author Felix Salten who also penned the Disney classic Bambi. He liked animals, obviously.